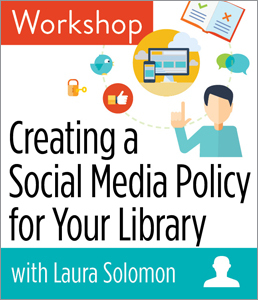 CHICAGO—ALA Publishing eLearning Solutions announces a new session of our popular workshop, Creating a Social Media Policy for Your Library with Laura Solomon. This workshop will last 90 minutes and take place at 2:30pm Eastern/1:30 Central/12:30 Mountain/11:30am Pacific on Thursday, Jan. 10, 2019. Social media is crucial to libraries in terms of both staff and patron usage. Facebook, Twitter, and other networks can be used for marketing, public outreach, and even for providing library services. Access to the internet and social media draws patrons into the library. But do you and your staff have policies that govern social media usage? Is your staff using social media strategically or haphazardly? Are your patrons using it in a safe and ethical way while they are in your building? In this workshop, library technology and instruction expert Laura Solomon shows you how to craft a social media policy that will help ensure that you and your staff are getting the most out of these resources and that you are protecting your community and patrons in the process. You'll learn how writing this kind of policy can be completely different than writing any other text for the library and what you might need in a policy for staff versus what you might need to spell out for patrons.